Are you excited about Thanksgiving? I am! Last week I shared a Thanksgiving sensory paint recipe and preschool math games with playdough turkeys. We are fully embracing Thanksgiving sensory play in anticipation of Turkey Day, and today I am sharing a new dough recipe. One of my favorite complements to Thanksgiving dinner is cranberry sauce, so I thought it would be fun to make a cranberry dough recipe. I remembered Fun at Home with Kids' Pumpkin Pie Play Clay and knew what to use to make the cranberry dough. 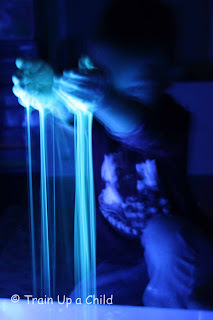 Directions: This two ingredient sensory play recipe couldn't be more simple. I combined roughly 1/2 a can of cranberry sauce and 1.5 cups of cornstarch and mixed well with my hands. It's not an exact recipe. I measured the first cup of cornstarch then eyed the rest until a dough formed. It's pretty simple. If the dough is crumbly add more cranberry sauce. If it is too wet and sticky add more cornstarch. I have to admit, at first I wasn't in love with the texture. I'm used to moldable doughs that stretch and pull. I left the dough uncovered in a container for a couple hours while my toddler twins napped. When they woke up I reached for the container and rolled the dough into a ball. I don't know if the dough just needed time to sit or what, but I loved the texture when I felt the dough for the second time. The texture of this dough is much different than the doughs we usually play with. It is firmer and a little crumbly, making it perfect for boosting fine motor skills. It can be reshaped and formed again after crumbling. Cranberry sauce might just be my favorite ingredient we have used this fall. Not only does it capture the essence of Thanksgiving dinner, the sweet smell is inviting and calming. After Peanut and Tank played with the cranberry dough I decided that instead of keeping it we should turn it into Oobleck. I brought out a cup of warm water for JZ (6) to add to the cranberry dough. He only needed to add about 1/4 of a cup to turn the dough into Oobleck. It took a little work to mix the water into the dough, but before long we had cranberry Oobleck. Oobleck, especially when colored and scented with an edible material like cranberry sauce, is safe for all ages and a wonderful first sensory material for babies and young toddlers. 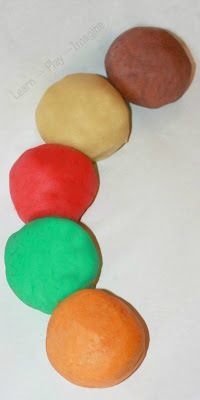 For more dough recipes and ideas for Thanksgiving sensory play follow me on Pinterest. LOVE it! I'm going to make this Monday for my two-year old class. Cornstarch is so amazing--it turns almost anything into something fun! Thanks. Awesome! My little ones respond poorly to food coloring, this is a great replacement for colored dyes as well! Thanks! Love it, Allison! I want to play with this! 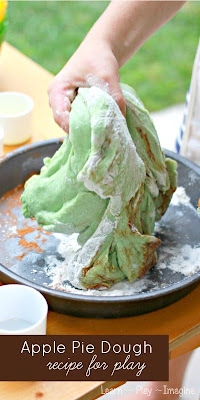 For sure kids are gonna have fun with this dough.. with different colors that looks attractive..